The 11.6-inch 2-in-1 tablet and laptop featuring Windows 10 Home Creator, is one of the most versatile mobile devices available today! This Microsoft Ink compatible tablet comes equipped with a digital pen that has 2048 levels of pressure sensitivity. The touchscreen display packs an awesome full HD resolution of 1920 x 1080 that is magnificently sharp for text, spreadsheets, painting, drawing, and video as well. 11.6 inch screen with a brilliant IPS Full HD 1920 x 1080 Touch Screen Display, 2 MP Front Camera, 5 MP Rear Camera. Intel Atom X5 Z8350 1.44 Ghz, Battery life up to 6 hrs. 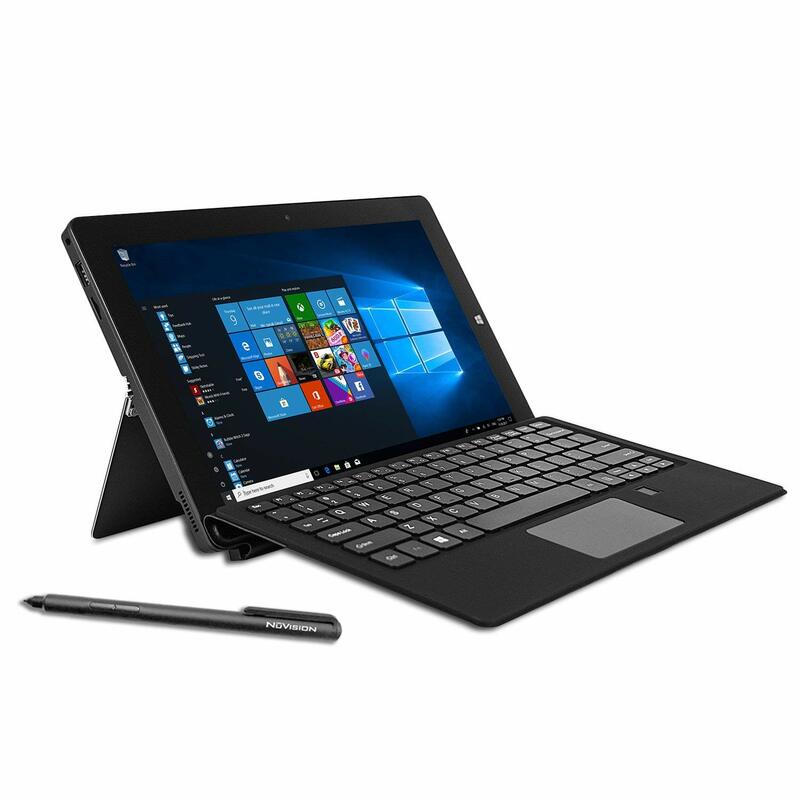 This is a great heavy-duty tablet for travel, work, school, and to use on vacations. Unlock your PC with your fingerprint instead of a password for faster hassle-free access. The keyboard features a specially designed magnetic 5 pin dock port that attaches and secures the tablet and the keyboard together. This will allow the tablet and keyboard to work in unison and provide a typical laptop experience. The fingerprint recognition on the keyboard helps you unlock the device instantly with a single touch with the Windows Hello feature. Windows Ink lets you quickly access the Windows Ink Workspace with just a click of your NuVision digital pen. Quickly turn thoughts into action by creating lists, sticky notes, markup a web page to share with associates, or draw and paint to your heart’s content. This will give you a powerful new way to work with your computer. Nuvision Kickstand 11 Draw has an aluminum metal body with the elegant black appearance. Easily position the strong kickstand on the back of the tablet to an optimal viewing angle.